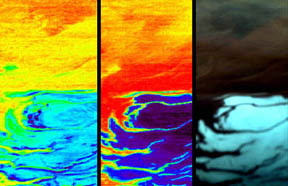 OMEGA, the combined Mars Express camera and infrared spectrometer, observed the southern polar cap of Mars on January 18, 2004, as seen on all three bands. Left: H2O, water ice. Middle: CO2, carbon dioxide. 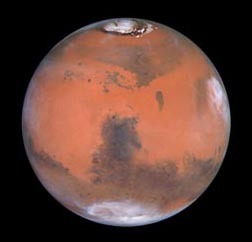 Right: Visible image of Martian south pole. Images credit: European Space Agency (ESA). South Pole of Mars - Is there melt in the water and carbon dioxide ice? Image courtesy Malin Space Science Systems. 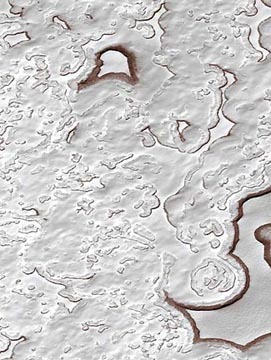 North and south poles of Mars are icy. Photo courtesy Hubble Space Telescope. February 23, 2004 Pasadena, California - The stated goal of the Mars rover missions is to look for evidence of water that might once have flowed in rivers, pooled in lakes, or even created an ocean on the red planet. Photographs like the branching delta below taken by the Mars Orbiter Camera suggest a large flow of water.